Mahishasuramardini, a unique programme that remains unparalleled in the history of radio across the world, remains a socio-historical milestone of Bengal. Jaago Tumi Jaago were the lines that opened the chanting in the form of songs voiced in chorus, practiced everyday before the programme religiously as if the group was performing a dedicated invocation to the Goddess at the crack of dawn on Mahalaya morning. If one were to write the cultural history of Bengal, one cannot omit the history of Mahishasura Mardini on Mahalaya. One did not need to even carry one’s transistor along because every single house in every single locality would play Mahishasuramardini with its Chandipath and the hymns so loudly that it would wake those who were trying to shake off sleep. Mahishasura Mardini or The Destroyer of Mahisasura is a collection of shlokas and songs broadcast by All India Radio or Akaashbani, Calcutta at four in the morning on Mahalaya. The man who did the Sanskrit recitations was Birendra Krishna Bhadra (1905 -1991) who became a legend in course of time, especially for his recitation of Mahishasura Mardini. This programme describes the epic battle of goddess Durga with the demon king Mahishashura. The script was written by Bani Kumar and the music was directed by Pankaj Kumar Mullick. The programme, which began in 1932, went on for two hours and 15 minutes and became the omnipresent music track for every Bengali and setting the tone for the the Durga Puja. The name that everyone recalls along with Mahishasuramardini is that of Birendra Krishna Bhadra. He worked for the All India Radio for several years starting in the1930s, and during that period he also acted in and directed several plays in Bengali theatre and even wrote the screenplay for a film called Nishiddha Phal (1955). Programme Director Nripendranath Majumdar, now almost forgotten, was the man who made it all happen. Bhadra narrated the Chandipath and also sang the songs. Earlier, it had a different form but the first proper Mahishasura Mardini was broadcast on 21 October 1937 on Mahalaya. The Chandipathwas done by Banikumar from 1932 but in 1937, the story goes that it was done by Bhadra himself. Earlier, this was done on Shashsti (the sixth day of the ten-day festival) at 6 am. But in 1937, the day was changed to Mahalaya and the timing was brought forward to 4 am. A regular poojawas performed by all the singers, instrumentalists and narrators before the programme went live. Bhadra himself would go to the Ganga to take a dip and would not dream of entering the studio without his ritual bath and pooja. Such was the dedication he performed the Chandipath with. The film Mahalaya produced by Nideas, presented by Prosenjit Chatterjee and directed by the relatively lesser known Soumik Sen from Mumbai, is not about Bhadra alone. Placing him at the centre of the narrative, the film, as its name gives out, focuses on the historic incident that happened in 1976 when Bhadra, Mullick and the other leaders were replaced because the administration demanded new blood be injected into the programme to make it more popular. Why? There is a strong suggestion that the Emergency in 1975 triggered this demand for change but this is not proved in the film. Rather, it details the different heads of different administrative bodies in the Ministry of Information and Broadcasting, All India Radio, programme producers such as Stevenson (Jayant Kripalani), Mr Sharma (Prosenjit Chatterjee) and others who put enormous pressure on the top brass to get Bhadra replaced. And who would the replacement be? Who else but the matinee idol Uttam Kumar (played by Jisshu Sengupta) himself? Mullick would be replaced by Hemanta Mukherjee who actually helped persuade a diffident Uttam Kumar to take on the assignment. Lata Mangeshkar and Asha Bhonsle would rehearse in Bombay under the guidance of Mukherjee and would come only on the morning the programme would be recorded. Recordings of the live programme began being aired from 1963. But the film shows Bhadra’s wife cribbing about why Akaashbani does not pay him at all for playing his recordings. The entire group, however, including the instrumentalists, would rehearse for three months before the programme went on air or was recorded. But this is not mentioned in the film at all. It is sad that the film steers clear of the musicians and chorus singers and focuses only on the elders and leaders like Mullick. The film rightly mentions how the name of the programme was changed to Debi Durgati Harini but it failed to work. READ | When is Mahalaya 2019? 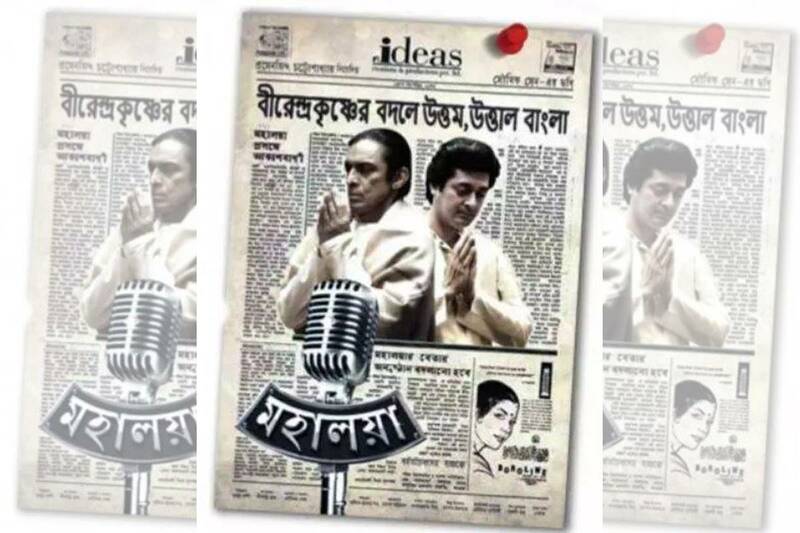 There are several detailed scenes of Uttam Kumar practising the chanting at home under the supervision of Mukherjee and getting dissatisfied with his failure to grasp the spirit that was omnipresent in the haunting voice of Bhadra. From the point when Uttam Kumar makes his entry till the end, Bhadra somehow gets second place in the film, which is sad because Shubhashish Mukherjee who plays Bhadra and resembles him too, gives a sterling performance within the space he is given by the screenplay. The death of Tagore is recorded from real documentary footage because it is used to focus on the speech and recitation of Bhadra on Akaashbani. The actors reach beyond the limitations of the script in every sense and the director deserves to be commended for assembling and controlling such a big cast filled with significant names of Bengali cinema. They smoothly slip out of their mainstream images to merge into the characters they had to portray. It is only Jisshu Sengupta who feels distinctly uncomfortable in the shoes of Uttam Kumar at certain places. Hemanta Mukherjee has been given a negative slant probably because rumours say that he was instrumental in initiating and executing the historic change. Some of the dialogues are catchy. Bhadra says, “If Akaashbani has left me, does it mean I will also leave it?” and not once does he express either anger or grief for having been shown the door from a programme he ran for decades. The soundtrack does not make optimum use of the Mahalaya programme, which would have both set and sustained mood. The sepia toned cinematography has given the entire film a period feel, which suits the tone. The art direction too leaves no room for criticism. Mahalaya comes out as an extremely informative and educative piece especially for a generation who are not familiar with Mahisashura Mardini and the legends, who were responsible for creating and sustaining it. But somehow, at the end of it all, one comes out of the theatre with the feeling that for some reason or the other, the script tends to idolise Uttam Kumar, which he never needed, then or now.